Manchester City’s goal scoring problems have not exactly been catastrophic this season, but the distinct lack of goals compared to last year has been something of an ongoing question for Roberto Mancini. Over the entirety of this season, both of City’s Argentine forwards have not been up to the level expected after the title winning campaign in 2012. Sergio Agüero’s injury problems have restricted the amount of games and thus he has only managed 9 goals, Carlos Tevez has not been at his most prolific also scoring 9 goals. Edin Džeko leads the City scoring charts with 12 goals in the Premier League but rumours surrounding the Bosnian striker’s future at the club have been rife for a long time now as suitors across Europe have reported to be interested in securing his signature. The Manchester midfield have also struggled to contribute the necessary goals for the team as David Silva has found the net only 4 times, and more surprisingly Yaya Toure sits level with the Spaniard on 4 goals. On top of this, the departure of Mario Balotelli to AC Milan in the January transfer window this year has only added to City’s striking woes. If the rumours are to be believed, the future of Carlos Tevez and Edin Džeko lie away from the Etihad Stadium. AS Monaco are reportedly interested in Tevez whilst Džeko has been heavily linked with a return to Germany. This would leave City with only one recognised striker in Sergio Agüero, subsequently raising the question, who will fill the void up front? As always, there are plenty of rumours circulating when it comes to City’s summer transfer targets and Mancini has been linked with several, high profile forwards. Neymar, Radamel Falcao and Edinson Cavani have all been labelled as potential acquisitions for City in the summer and I have no doubt that Mancini will sign at least one big name forward in the transfer window, especially after losing out on Robin Van Persie to rivals United last year. But instead of spending many millions on several forwards, why not promote from within? 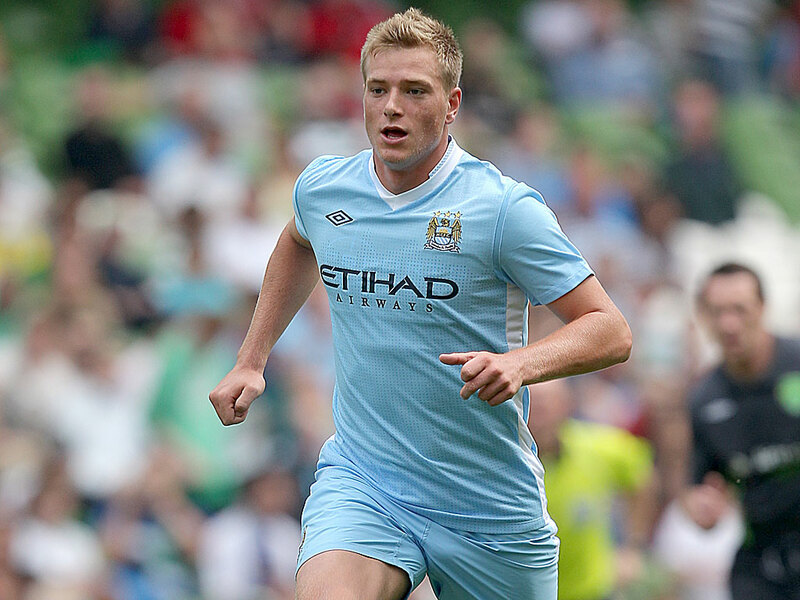 21-year-old, John Guidetti has been mulling around at Manchester City for a while now but has yet to make his debut for The Citizens in the Premier League. The Swedish forward, who has been labelled The New Ibrahimovic is a highly promising, young player who signed for City as a 16-year-old in 2009 during Sven-Göran Eriksson’s tenure. Guidetti’s huge potential is only matched by his confidence which he exudes in droves. His belief in his own ability on the pitch could be compared to that of ex-team mate Mario Balotelli, minus the chip on the shoulder. The Swede was included in the In Bed With Maradona 100 for 2012, but as a fifth choice striker behind the likes of Balotelli, Džeko, Agüero and Tevez he struggled to break into the City first team. There was little to no chance for the talented Swede to break the dominance of the four, world class forwards at City, who were all vying for a starting berth. A loan move to the Eredivisie would provide the platform for Guidetti’s development. Feyenoord came calling and Guidetti swiftly moved to the Rotterdam outfit on loan for the 2011/2012 season. The move would prove to be both a gift and a curse for Guidetti. He played 23 matches for Feyenoord scoring 20 goals and contributing 8 assists in a season where he helped the team finish 2nd in the league. This was no mean feat for a side that had finished a lowly 10th in the previous campaign. A couple of hat-tricks (including one against Ajax), his energy and leadership qualities endeared him to the Feyenoord faithful during his relatively short period in Holland. However, his time at Feyenoord was cut short due to a bizarre but serious illness. The Swede contracted food poisoning from chicken eaten at a party which turned out to be a virus affecting his central nervous system, causing him to lose all feeling in his right leg and effectively putting his football career on hold. Guidetti returned to Manchester City for 9 months of intense medical treatment. His absence from the Feyenoord team had a telling effect on their final league position as his goals could have secured the Eredivise title. Having coached both Zlatan and John, Koeman is better placed than most to comment on the strikers ability and potential. Guidetti signed a new, three year contract at Manchester City in October last year, re-affirming City’s belief that they have a special player on their hands and also showing faith in Guidetti after his illness. Now that Balotelli has gone and the future of Tevez and Džeko is mired in uncertainty, maybe this could be the chance for Guidetti to make the step up to the first team. It is doubtful that he will be a regular starter for The Citizens, but Mancini has shown faith in the young striker as he blocked a potential move to Swansea in January. Guidetti is a highly confident, hungry and energetic player but overall he is a proven goal scorer and it is not beyond the realms of possibility that he can help to fill the striker void for Manchester City in the 2013/2014 campaign.